Lyra Belacqua is an orphan who lives happily in Jordan College, Oxford, playing with local boys and terrorising the professors. However, when Lyra overhears scholars discussing a plot against her uncle, Lord Asriel, centering around a mysterious substance called Dust, her curiosity is roused. Soon Lyra is in over her head as she uncovers a frightening plot and a whole new world of possibilities. 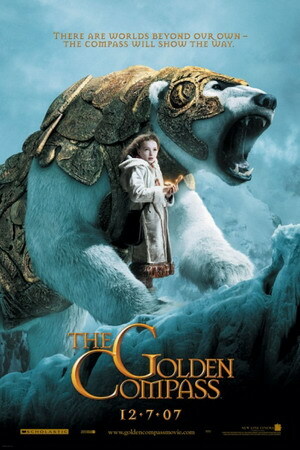 Ok, I must read the novel that is adapted into this movie (note to self: find 'The Northern Light' novel by Phillip Pullman). Even though the movie tells sufficiently of the storyline, I still need to understand some finer details to get the big picture. But it doesn't need me to read the book to know why some people are crying foul about this movie being anti-Christians. The Magisterium officer looks like he's wearing a priest robe and the leader slightly resembled the Pope (no puns intended). Enough said. I do feel a strong objection to Mr Pullman's statement in the Time magazine, that religion should not get mixed up with every day life. Yes, some religion-based organisations are fanatical, but it's not the religion itself which is at fault. After all, religion is to guide people through every day's life, guiding us on human relations, human-environment relations, etc. It provides a sense of purpose to us human beings as well. Otherwise, people would be asking, 'Why should I do good deeds? What good does it come from it when bad people can benefit more?' In conclusion, religion is our moral compass. For me, religion is the path to heaven.